A team from Calicut Heritage Forum, led by Dr.Oliver Noone visited Trikkulam, near Tirurangadi, looking for traces of the bloody battle that took place there between the British forces from Venkitikkotta (present Kottakkal) and the forces of Tipu. We were looking for traces of a Fort which Tipu had built there. No one - including the history professors of the local college- had heard of such a fort in Trikkulam. But, our local guide, the indefatigable Gopi would not give up. He contacted the Village Officer, Shekharan (another history buff, he turned out to be) who confirmed that there was indeed a mention in revenue records of a Fort on a large piece of land on the banks of the Parakkadavu River. 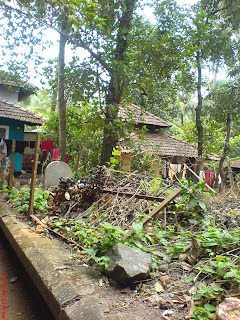 The land described in the records as 'Kottapparamba' does not have any trace of a fort today and is dominated by some garish bungalows surrounded by a couple of old tiled houses. The plain ground where the battle took place is now a large coconut grove, but the approach to the river showed clearly a strategic eye. There was a story of an underground path to the river but we could not explore the environs in greater detail, as the place was being used as a bathing ghat by women. While we could not obtain much by way of tangible evidence of Tipu's Fort, we stumbled on living proof of how neglect and prejudice can destroy our history and heritage. The history professor took us to some graves of British soldiers who had laid down their lives in the 1921 revolt. The grave of the young 28 year old Assistant Superintendent of Police, Palghat was in front of the Taluk Office and appeared to be fairly well- protected, although weeds were gradually taking over the tombstone. 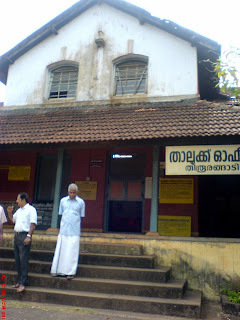 The local Tahsildar mentioned that the Tirurangadi Taluk Office (built in 1906) was being vacated and the building will then be handed over to the Archeology Department for conservation. He hoped that along with this, the grave of Rowley in front of his building would also be preserved by the department. protected by iron fencing but gradually, the fencing had been stolen presumably by scrap dealers and the tomb stones themselves have been dislodged. We could dig up one of those but the other one in the same enclosure was too deeply buried in rubbish dumped over the last 70 odd years. One wishes a body like the Commonwealth Graves Commission takes care of these neglected and vanishing pieces of history.With the present resources all that Calicut Heritage Forum can do is to highlight the plight of such monuments! Thank you for posting this article, and thank you for trying to preserve the graves. If you are able to tell me more about the date on which the battle with Tipu occurred, I might be able to match it with some transcripts of accounts of these actions I have. It might prove possible to locate the fort. Many thanks, Nick for the offer of help. Dr Noone is researching Trikkulam. He will get in touch with you. CKR - That is an interesting trip. The Kottaparamaba mentioned may have had a fort or a fortified palace. However i have read of a tippu's temporary fort in Ramanagar while he was waiting to get the ferokh fort built. he had found the calicut fort (presumably the Chinese - Portuguese fort) unworthy. Ramanagar sounds strange to me - I thought it was Ramanattukara. Was it perhaps this fort? And of course i forgot - there was also the Anagadipuram - Palur fort nearby. I wonder if there could be three forts in a 50 square mile area. was it perhaps a Marakkar fortification that Tipu used? Thanks Maddy and Premnath. You are right, Maddy. It might have been a small fortification. There were no traces of either the Chinese or Portuguese forts by the time Tipu had reached Malabar. Anyhow, Dr.Noone will explore it further. I had intended to highlight the plight of 1921 graves and the need to preserve these. Please accept my congratulations to Dr. Noone, you and others who made the “Eye opening” trip to Tirurangadi and brought to light the little know battles and the souls that were lost. It makes a very poignant reading. A few years ago I had read an article about the war graves in and around the Indo –Burma border .One epitaph has stuck in my mind ever since. The tomb is that of very young British boy in his twenties, which was erected by his parents. It said, “ For the world he is only a soldier, but for us he is our son”. You will agree with me it speaks volumes and is very touching. During the first world war was there action in this area? 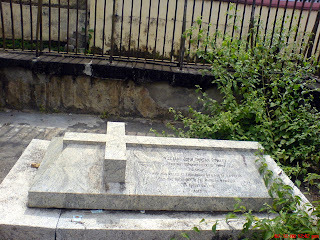 Calicut also had many graves for the British who lost their lives while they were here. One was just behind the beach hospital and the other was in the English Church compound. Both were cleared and the remains were shifted with Tombstones to the graveyard in West Hill. Another memorial for the fallen British and Indian personnel of the police force is in the court yard of Police commissioner’s office - Hitchcock Memorial was shifted from Malapuram area. In Tellicherry on the western side of the fort there is a Church[Pl.see the attachment] next to the Catholic Church, which in olden days were known as “English Church” now it is under the CSI congregation. 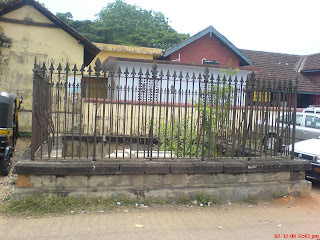 Here also you have lot of undisturbed graves, so also in Kannur , opposite the Hospital in the fort area. I am not sure how long the status will continue. My knowledge of history is very limited; history being one of the subjects in which I have been interested in.But Calicut Heritage Forum has added history to my list.Thank you. I now feel that like any knowledge, history also can add a lot to one's horizon of thinking. Many thanks, Premnath and Narayanan for the kind words of encouragement.There is some truth in George Santayana's oft-misquoted statement: 'Those who cannot remember the past are condemned to repeat it'. ! Tippu seems to have built many forts. A sense of insecurity or to impose his power? As I blogged recently, one even in Madayi.Unfortunate that only the ruins remain. details which is unknown to most of the people.Now i feel those who love History must view your blogs . Thank u verymuch for publishing this article.I felt that I went through this places even not.And one more request;will u pls upload Rowley's photo and biography? did you get a reply from Calicut Heritage Forum I am researching Duncan Rowley .Will be very happy to get any shred of information on him. Not yet got the snap of Sir.Rowley. Thank you, Sophia, for visiting our site. Please see our reply to Lijo. You may please write to us at the email Id given stating your requirements. We shall try to help obtain the necessary details or put you in touch with the concerned specialist. I have written to you. Awaiting a reply. Hi Dr.Noone, it is Lijo from Bangalore, I really appreciate you to gave more informations. Will You please upload snaps of all British Officers who lost their lives in Tirurangadi & Trikulum wars? And pls upload the photos of all the places and graves and English Church which mentioned by Mr.Premanath Murkoth on 16th Dec 2008.